PETER RABBIT was so full of questions that he hardly knew which one to ask first. But Yellow Wing the Flicker didn't give him a chance to ask any. From the edge of the Green forest there came a clear, loud call of, "Pe-ok! Pe-ok! Pe-ok!" "Excuse me, Peter, there's Mrs. Yellow Wing calling me," exclaimed Yellow Wing, and away he went. Peter noticed that as he flew he went up and down. It seemed very much as if he bounded through the air just as Peter bounds over the ground. "I would know him by the way he flies just as far as I could see him," thought Peter, as he started for home in the dear Old Briar-patch. "Somehow he doesn't seem like a Woodpecker because he is on the ground so much. I must ask Jenny Wren about him." It was two or three days before Peter had a chance for a bit of gossip with Jenny Wren. When he did the first thing he asked was if Yellow Wing is a true Woodpecker. "Certainly he is," replied Jenny Wren. "Of course he is. Why under the sun should you think he isn't?" "Because it seems to me he is on the ground more than he's in the trees," retorted Peter. 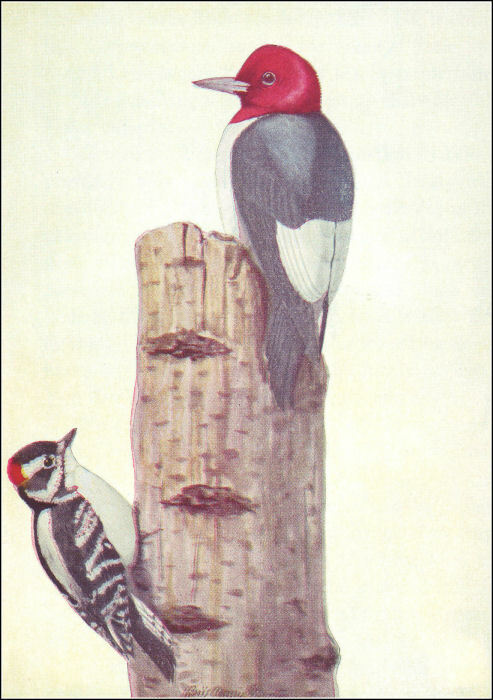 "I don't know any other Woodpeckers who come down on the ground at all." "Tut, tut, tut, tut!" scolded Jenny. "Think a minute, Peter! Think a minute! Haven't you ever seen Redhead on the ground?" Peter blinked his eyes. "Ye-e-s," he said slowly. "Come to think of it, I have. I've seen him picking up beechnuts in the fall. The Woodpeckers are a funny family. I don't understand them." Just then a long, rolling rat-a-tat-tat rang out just over their heads. "There's another one of them," chuckled Jenny. "That's Downy, the smallest of the whole family. He certainly makes an awful racket for such a little fellow. He is a splendid drummer and he's just as good a carpenter. He made the very house I am occupying now." Peter was sitting with his head tipped back trying to see Downy. At first he couldn't make him out. Then he caught a little movement on top of a dead limb. It was Downy's head flying back and forth as he beat his long roll. He was dressed all in black and white. On the back of his head was a little scarlet patch. He was making a tremendous racket for such a little chap, only a little bigger than one of the Sparrow family. You will know him instantly by his all-red head. His smaller size and the black bars on the white outer feathers of his tail distinguish him. "Is he making a hole for a nest up there?" asked Peter eagerly. "Gracious, Peter, what a question! What a perfectly silly question!" exclaimed Jenny Wren scornfully. "Do give us birds credit for a little common sense. If he were cutting a hole for a nest, everybody within hearing would know just where to look for it. Downy has too much sense in that little head of his to do such a silly thing as that. When he cuts a hole for a nest he doesn't make any more noise than is absolutely necessary. You don't see any chips flying, do you?" "No-o," replied Peter slowly. "Now you speak of it, I don't. Is—is he hunting for worms in the wood?" Jenny laughed right out. "Hardly, Peter, hardly," said she. "He's just drumming, that's all. That hollow limb makes the best kind of a drum and Downy is making the most of it. Just listen to that! There isn't a better drummer anywhere." But Peter wasn't satisfied. Finally he ventured another question. "What's he doing it for?" "Good land, Peter!" cried Jenny. "What do you run and jump for in the spring? What is Mr. Wren singing for over there? Downy is drumming for precisely the same reason—happiness. He can't run and jump and he can't sing, but he can drum. By the way, do you know that Downy is one of the most useful birds in the Old Orchard?" Just then Downy flew away, but hardly had he disappeared when another drummer took his place. At first Peter thought Downy had returned until he noticed that the newcomer was just a bit bigger than Downy. Jenny Wren's sharp eyes spied him at once. "That shows you haven't learned to use your eyes, Peter," said Jenny rather sharply. "Look at the outside feathers of his tail; they are all white. Downy's outside tail feathers have little bars of black. Hairy is just as good a carpenter as is Downy, but for that matter I don't know of a member of the Woodpecker family who isn't a good carpenter. Where did you say Yellow Wing the Flicker is making his home this year?" "Over in the Big Hickory-tree by the Smiling Pool," replied Peter. "I don't understand yet why Yellow Wing spends so much time on the ground." "Ants," replied Jenny Wren. "Just ants. He's as fond of ants as is Old Mr. Toad, and that is saying a great deal. If Yellow Wing keeps on he'll become a ground bird instead of a tree bird. He gets more than half his living on the ground now. Speaking of drumming, did you ever hear Yellow Wing drum on a tin roof?" "Well, if there's a tin roof anywhere around, and Yellow Wing can find it, he will be perfectly happy. He certainly does love to make a noise, and tin makes the finest kind of a drum." Just then Jenny was interrupted by the arrival, on the trunk of the very next tree to the one on which she was sitting, of a bird about the size of Sammy Jay. His whole head and neck were a beautiful, deep red. His breast was pure white, and his back was black to nearly the beginning of his tail, where it was white. "Hello, Redhead!" exclaimed Jenny Wren. "How did you know we were talking about your family?" "Hello, chatterbox," retorted Redhead with a twinkle in his eyes. "I didn't know you were talking about my family, but I could have guessed that you were talking about some one's family. Does your tongue ever stop, Jenny?" Jenny Wren started to become indignant and scold, then thought better of it. "I was talking for Peter's benefit," said she, trying to look dignified, a thing quite impossible for any member of the Wren family to do. "Peter has always had the idea that true Woodpeckers never go down on the ground. I was explaining to him that Yellow Wing is a true Woodpecker, yet spends half his time on the ground." Redhead nodded. "It's all on account of ants," said he. "I don't know of any one quite so fond of ants unless it is Old Mr. Toad. I like a few of them myself, but Yellow Wing just about lives on them when he can. You may have noticed that I go down on the ground myself once in a while. I am rather fond of beetles, and an occasional grasshopper tastes very good to me. I like a variety. Yes, sir, I certainly do like a variety—cherries, blackberries, raspberries, strawberries, grapes. In fact most kinds of fruit taste good to me, not to mention beechnuts and acorns when there is no fruit." "Is it true," asked Peter, "that Redhead does such a dreadful thing?" Jenny bobbed her head rapidly and jerked her tail. "So I an told," said she. "I've never seen him do it, but I know others who have. They say he is no better than Sammy Jay or Blacky the Crow. But gracious, goodness! I can't sit here gossiping forever." Jenny twitched her funny little tail, snapped her bright eyes at Peter, and disappeared in her house.